the fluid containing water and waste products that is secreted by the kidneys, stored in the bladder, and discharged by way of the urethra. Contents of the Urine. Several different types of waste products are eliminated in urine (for example, urea, uric acid, ammonia, and creatinine); none are useful in the blood. The largest component of urine by weight (apart from water) is urea, which is derived from the breakdown of dietary proteins and amino acids in the diet and those of the body itself. Its amount varies greatly from person to person, however, depending on the amount of protein in the diet. Besides waste materials, urine also contains surpluses of products necessary for bodily functioning, such as water, sodium chloride, and other substances. Thus in a typical specimen of urine there will be sodium, potassium, calcium, magnesium, chloride, phosphate, and sulfate. The color of urine is due to the presence of the yellow pigment urochrome. Individual ingredients of urine are not usually visible, but when the urine is alkaline some of the ingredients may form sediments of phosphates and urates. The urine may also become cloudy from the presence of mucus. Persistent cloudiness may indicate the presence of pus or blood. Common causes of variations in the color of urine are summarized in the accompanying table. fractional urine examination of a urine specimen with separate examination for different solutes, generally meaning that the specimen is tested for the presence of glucose and acetone. residual urine urine remaining in the bladder after urination; seen in bladder outlet obstruction and disorders of deficient detrusor contractility. The fluid and dissolved substances excreted by the kidney. (u´rin) the fluid excreted by the kidneys, stored in the bladder, and discharged through the urethra. residual urine urine remaining in the bladder after urination. The waste product secreted by the kidneys that in mammals is a yellow to amber-colored, slightly acidic fluid discharged from the body through the urethra. the fluid secreted by the kidneys, transported by the ureters, stored in the bladder, and voided through the urethra. Normal urine is clear, straw-colored, and slightly acid; has the odor of urea; and has a specific gravity between 1.003 and 1.035. Its normal constituents include water, urea, sodium chloride, potassium chloride, phosphates, uric acid, organic salts, and the pigment urobilin. Abnormal constituents indicative of disease include ketone bodies, protein, bacteria, blood, glucose, pus, and certain crystals. See also bacteriuria, glycosuria, hematuria, ketoaciduria, proteinuria. urinary, adj. Urine consists of approx. 95% water and 5% solids. Solids amount to 30 to 70 g/L and include the following (values are in grams per 24 hr unless otherwise noted): Organic substances: urea (10 to 30), uric acid (0.8 to 1.0), creatine (10 to 40 mg/24 hr in men and 10 to 270 mg/24 hr in women), creatinine (15 to 25 mg/kg of body weight per day), ammonia (0.5 to 1.3). Inorganic substances: chlorides (110 to 250 nmol/L depending on chloride intake), calcium (0.1 to 0.2), magnesium (3 to 5 nmol/24 hr), phosphorus (0.4 to 1.3). Osmolarity: 0.1 to 2.5 mOsm/L. A urine sample voided within 30 min after the patient has emptied the bladder. A collection of urine taken during a few specified hours or from a specified quantity rather than from the entire amount voided during a day. Urine left in the bladder after urination, an abnormal occurrence that may accompany enlargement of the prostate or the use of drugs, e.g., antihistamines or anticholinergics, that prevent complete voiding of urine. > 300 mg/day Macroalbuminuria. Indicative of progressive kidney failure. Injury to glomeruli or tubulointerstitium of kidney. > 3500 mg/day Nephrotic range proteinuria. Evaluation may include kidney biopsy. The fluid excretion of the kidneys, a solution in water of organic and inorganic substances, most of which are waste products of METABOLISM. Normal urine is clear, of varying colour, of specific gravity between 1.017 and 1.020 and slightly acid. It contains UREA, URIC ACID, creatinine, ammonia, sodium, chloride, calcium, potassium, phosphates and sulphates. an aqueous solution of organic and inorganic substances, that is the waste product of METABOLISM. In mammals, elasmobranch fishes, amphibia, tortoises and turtles, nitrogen is excreted in the form of UREA which in humans forms 2% of the urine on average. The fluid excreted by the kidneys, stored in the bladder, then discharged from the body through the tube that carries urine from the bladder to the outside of the body (urethra). n the fluid excreted by the kidneys. 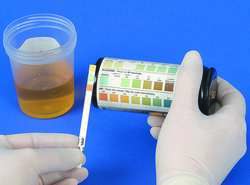 Normal urine is clear, straw-colored, and slightly acidic, and has the characteristic odor of urea. the fluid containing water and waste products which are secreted by the kidneys, stored in the bladder and discharged by way of the urethra. See also urinary. increasing the pH of urine by the administration of alkalinizing agents such as sodium bicarbonate; used to increase the solubility of cystine in the management of cystine urolithiasis in dogs. in farm animals is observed in nutritional deficiency of sodium chloride. the rate of flow may be reduced—oliguria, absent—anuria, or increased—polyuria. measure of urine flow rates. may be found in small amounts in normal animals. 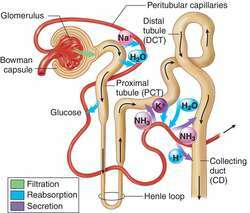 Increased amounts occur in renal disease due to disruption of glomeruli and defects in tubular reabsorption. 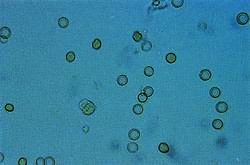 calcium oxalate crystals are maintained and can enlarge in urine oversaturated with these minerals. a measure of the number of dissolved particles per unit of water in urine. See also osmolality. calcium and oxalate crystals will spontaneously precipitate, grow and aggregate. caused by the presence of urine in the peritoneal cavity as in rupture of the bladder. the normal range varies with the animal species. Herbivores have a higher pH than carnivores because of differences in the diet. Alterations occur with changes in acid-base balance and infection in the urinary tract. urine remaining in the bladder after urination; seen in bladder outlet obstruction (as by prostatic hypertrophy) and disorders affecting nerves controlling bladder function. midstream collection is standard; for culture the sample should be collected by catheter or suprapubic, percutaneous needle insertion into the bladder. scalding of the perineal area, and sometimes the hindlegs, by urine. It may be the result of urinary incontinence or the animal's inability to assume normal posture when urinating, i.e. paresis or paralysis of the hindlimbs. In rabbits it is caused by poor cage accommodation and frequent wetting of the area with urine. Secondary infection of the dermatitis is common. a centrifuged deposit suitable for microscopic examination for the presence of cells, casts, bacteria, crystals, etc. urine leaking from a damaged urethra collects in a subcutaneous site. Q. How you stop urinating frequently? I don't have any conditions that make me urinate often. I simply drink lots of water... Is there some trick I can employ so that I can still drink lots of water but not have to go to the bathroom so frequently? A. I only drink water and green tea, Thanks. Q. Today doctor removed my stunt of kidney. It inflamate while urination.. till How long i will feel like this? A. You should consult your doctor, since instruments in the kidney and urinary tracts can cause infections (even after removing them), that may cause symptoms like you describe.